The Preview Party for the 2014 Florida Film Festival took place on Wednesday, March 12, 2014 at 6:00 p.m. I have never been to a film festival before, so did not really know what to expect. I knew there would be free snacks and drinks and that the list of films would be announced. I figured we would see clips of some of the films. I have to admit I’m a little intimidated by the idea of attending a film festival. It seems like something ordinary people don’t do. I have no connection to the film industry and I’m certainly not famous. It just sounds like fun to see a bunch of movies, and especially independent films that I might not otherwise get to see. My first moment of intimidation came when I realized I had to figure out something to wear. I had no idea what to wear to a film festival! I hoped no one was expecting a gown. Google Image Search to the rescue (as is so often the case)! Searching for Florida Film Festival Preview Party netted me a half dozen pictures from inside the theatre. Looks like business casual. Thank God! My Festival Pass gave me 2 tickets to the Preview Party. My husband was working late, so I invited my mother to go with me. We arrived about 15 minutes early. The Enzian Theater is set back from the road; you can’t really see it when you are driving by. The Theater is surrounded by weeping oak trees. The landscaping is the kind of lush tropical greenery you expect in Florida. A row of Adirondack chairs painted in University of Florida Gator Blue, but without the Gator Orange stripe, lines the edges of the lawn to the left of the building. Attached to the theater building is the Eden Bar, which has no walls. The entire scene is beautiful, and instantly relaxing because it feels like a perfect chill vacation spot. Don’t you want to hang out here? My mom and I accidentally skipped the red carpet that led the way into the theatre and the Florida Film Festival backdrop with professional photographer taking pictures of everyone as they entered. Oops. We checked in at the desk in the lobby. I then had to go to a different desk inside the theatre in order to pick up my Festival pass. When I picked up my pass, I initialed for receipt next to my name on a spreadsheet printout. It looks like less than 30 people have passes so far. I was wondering about that; my pass gives me first admission into films with a priority line, guaranteeing seating. I waffled a bit about getting a ticket package versus getting the pass. One reason I went with the pass was because I wanted to make sure I got to see the films I really want to see when I want to see them. I was afraid there might be so many passholders that I wouldn’t get to see a film, even if I had a ticket. I probably didn’t need to worry so much! This was my first time inside the Enzian Theater. The Theater has 4 tiers. 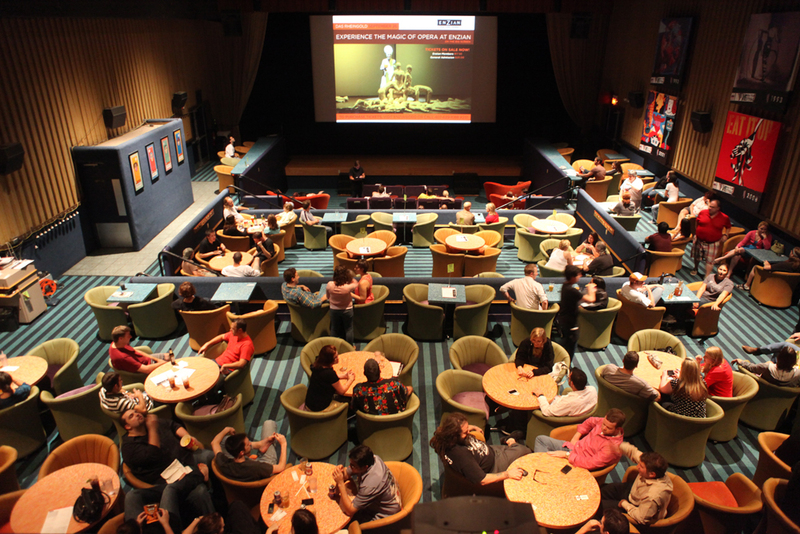 Since it is a dine-in theater, every seat is at a table and the levels are wide to accommodate the tables. We sat at a table on the third level, facing the screen directly. Many seats do not directly face the screen. I think I would find that annoying, having to turn back and forth between the table and the screen. This official press photo was clearly taken some time ago. The interior has since been remodeled, with different carpet, chairs, and tables. The layout remains the same. We did order dinner from the menu. The snacks were pretty standard crackers, fruit, cheese, and popcorn. We were hungrier than that! I got a grilled cheese sandwich and tomato cream soup. My mother got a grilled chicken sandwich. All the food was good. The evening kicked off with a video introduction to the Enzian and the Film Festival. The night’s MC did a bit of rambly introduction to the Enzian and the Film Festival, specific people involved in one or the other including the primary private sponsor of the Festival, and a few of the movies. He also announced the discussion panels and two celebrity guests who will be attending the Film Festival. 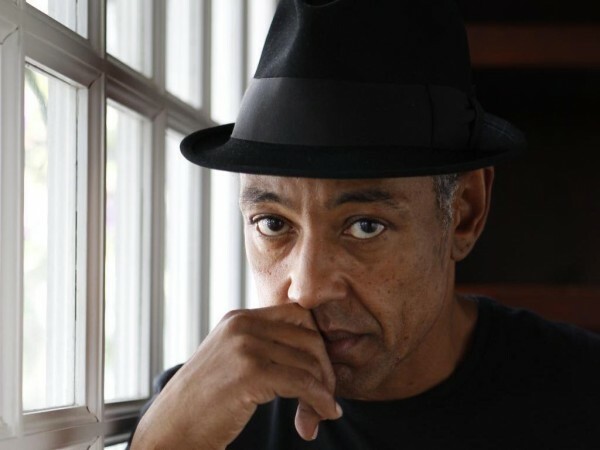 The first celebrity guest is Giancarlo Esposito (Major Tom Neville in Revolution). 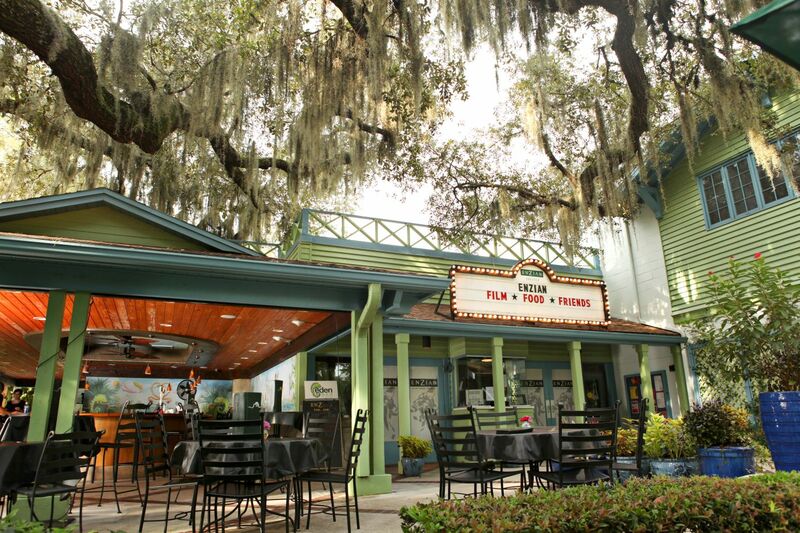 The Florida Film Festival’s habit is to screen one of a celebrity’s films and then have an open discussion with the celebrity after the screening. The Festival will be showing Spike Lee’s Do the Right Thing, in which Giancarlo Esposito played Buggin’ Out. 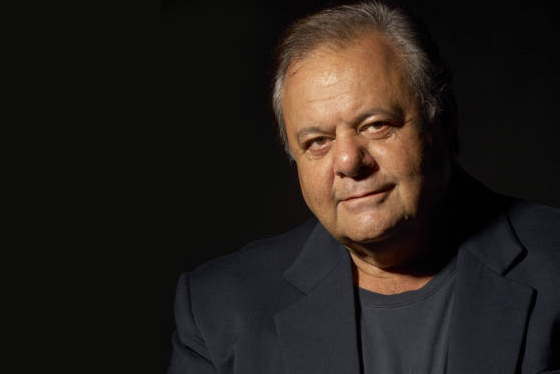 The second celebrity guest is Paul Sorvino (Paul Cicero in Goodfellas). One of Sorvino’s recent films, Last I Heard, in which he plays a gangster just released from prison after serving a 20 year sentence, is a Festival film. The Florida Film Festival is in discussion with other celebrities, names not disclosed, and other guests / screenings will be announced as we get closer to the event itself. After the announcements, we watched three shorts and a whole pile of trailers. The MC told us they had a reel of 80-90 trailers they were going to play for us. We ended up only seeing 28 of them because there was a movie scheduled in the theater at 9:45 and they needed us all to leave so they could clean up the theater to be ready for the movie crowd. I was glad they cut the trailers short. I was starting to feel a little overwhelmed by how many movies I want to see! Since I don’t want you getting overwhelmed with an uber-long post, I’m going to break this into two parts, with Part 2 consisting of a review of the three shorts and my initial thoughts on the trailers.